Cecil is a Registered Engineering Technician and holds an NHDip (Electrotechnical Engineering – heavy current); Installation Electrician (IE); and Master Installation Electrician (MIE). He is a member of the SA Institute of Electrical Engineers (MSAIEE); and member of the Chamber of Engineering Technicians (MCET). He is also an assessor for the Electrical Skills Education Training Authority (ESETA) and serves on some 20 SABS technical committees and workgroups and other committees and associations. Cecil joined the ECA(SA) as an ordinary member in 1986, and as an employee in 2002, when he was appointed Regional Director of the Bosveld (Pretoria) region, taking over from Fanie Steyn. Cecil is the Technical Advisor and Secretary for the ECA National Technical Committee and serves on most of the ECA(SA) National Committees. Despite the expectation that completing a Certificate of Compliance (CoC) correctly would be the forte of any contractor, most of the enquiries received at the ECA revolve around the correct completion of CoCs. The ECA(SA) presents a number of CoC courses every year and it is imperative that contractors attend these courses at least bi-annually to stay abreast of any new developments. Contact your nearest ECA office to reserve your place in the next class. It remains one of the best investments in your future. Question: What is the correct way of completing the ‘Certificate-part’ of the CoC? 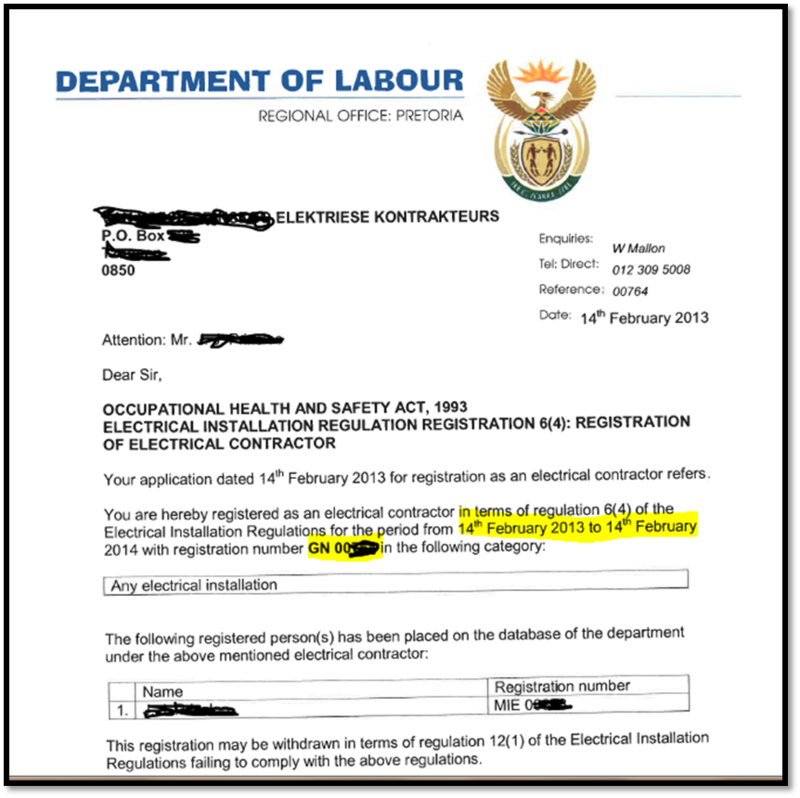 Answer: This is the first page of the combination CoC and test report, available from the ECA (SA) and is the legal part as prescribed in Annexure 1 of the Electrical Installation Regulations of 2009 (EIR). The unique number, allocated by DoL and pre-printed on the form in red ink. An additional CoC to an existing one, tick ‘Supplementary Certificate’, which indicates that this is a partial document only, and it must be read together with an ‘Initial Certificate’ and possibly other ‘Supplementary Certificates’ for it to be valid. If this CoC is Supplementary, enter the number (1st, 2nd, 3rd etc), and the number and date of issue of the ‘Initial Certificate’. The purpose of this section is to positively identify the installation for which this CoC is issued, and link them together forever. Ensure that the address on the left-hand part is complete and correct. If a formal address is not available, information such as ‘GPS Coordinates’, ‘Pole number’ or ‘Erf / Lot number’, can be used instead. It is not crucial in this section that ALL fields such as ‘GPS Coordinates’, ‘Pole number’, ‘Lot number’ be completed. In cases where such information is available, it can only be advantageous to include it. In interest of completeness, enter N/A into any spaces that may be irrelevant. Spaces left blank give the impression that the certificate is incomplete. Full names of registered (accredited) person, as it appears on his/her documentation, and his/her identity number. This used to be an ‘Accreditation number’ and, before that, ‘Wireman’s’ Licence’. Signature of registered (accredited) person to confirm the declarations above, and accept responsibility for the accuracy of the test and inspection. The date of affixing his/her signature. All his/her personal contact details (for use even if he/she changes employers). Many contractors argue that they need not complete this section when certifying an existing installation, as the ‘installation’ was not done by them. They are wrong, ‘electrical installation’ referred to here is the work done when issuing the CoC, which is the test and inspection, and not any previous installation work done by others in the past. Insert the full names of the director, owner, manager or contact person of the electrical contracting business (not necessarily the registered or accredited person), and his/her ID number. DoL registration number of the business, for example, GN 0123. Date of latest registration or last ‘renewal’ with DoL. It is recommended to add the expiry date as well. This is the date of affixing his/her signature. All of the business’ contact details as required. This is just a ‘receipt’ from the client, to prove delivery. Failure to have this completed will not necessarily render the certificate invalid. ** Please note that in instances where there is no ‘Contractor-Client’ relationship, for instance, where the CoC is issued by an employee of a company or institution for work done on its own installation and there is no ‘contract agreement’ but, for example, salary paid, this section ‘Declaration by Contractor’ is not applicable. It can be crossed out, or all the allotted spaces marked ‘N/A’. The same will apply in cases where a registered person certifies work on his/her own property. NB: Take note of the NOTES! In Part 4, we will begin the Test Report.